Cracking in driveways is a normal occurrence given the fact that the surface is exposed to the elements 365 days a year. Eventually those elements, plants and dirt all combine to start small breaks and make them bigger over time. Before getting started, a project is helped tremendously by understanding as best as possible what has caused the crack. If the issue is a tree root, for example, crack repair won't stop the cause pushing up on the cement. If, on the other hand, the crack is caused by separation of the cement integrity itself, then the repair can get started without other steps involved. Because crack repair can involve a number of different tools, it's a good idea to prepare a number of items ahead of time before getting started. This includes wearing clothes that can get stained, basic tools such as a wire brush and hammer and chisel, a water source from a hose, and eye protection glasses. Ideally, repair involves cleaning out the damaged area so that new filler can adhere completely and seal up the gap that has been created over time. Using a wire brush, most residue and dirt can be forced out and cleared from the crack. If the crack has jagged bits or small, stubborn pieces, then a hammer and chisel can be used to remove them. A final cleaning should be applied with hose water, washing out any remaining material. The size of the crack will usually dictate the type of filler used. 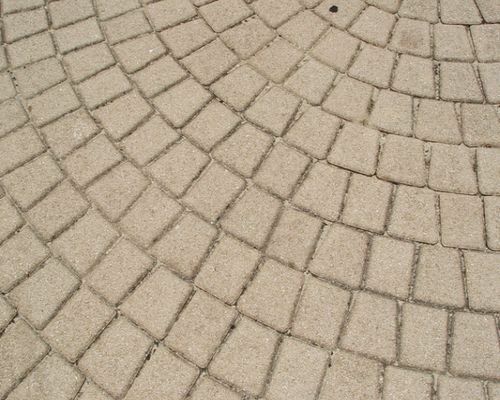 Small cracks can be treated with basic caulk or sealer or, in the case of pavers, liquid grout. Once pushed in and spread, the filler seals the gap and will provide a durable protection for years. It's also good to use a trowel to press the filler in and wipe off excess material. Because different products have different curing times, it's important to follow the particular instructions provided for application and drying before the driveway is used again. Large cracks require a bit more work. Cracks with a gap of ½ inch or more should be considered for routing out where the crack is widened to make sure the bottom is not bigger than the visible top of the crack. Doing so can take some manual work with a chisel and hammer or a hammer drill for larger jobs. With the crack completely exposed and cleaned, a number of materials can be used to fill the gap. In some cases additional cement will work. In others, a faster approach can be concrete grout, vinyl concrete patch, or textured caulk. Again, in each case the filler used has specific applications and drying times that have to be followed. Just like with small cracks, the use of a trowel makes the job more precise and easier. If you are seeing cracks in your driveway and are concerned that they are getting worse then give Driveways Manchester a call. We’ll be happy to inspect the problems and advise the best plan of action to tackle the issues. We offer a FREE no obligation quote to ensure that you are in good hands.